Butterflies and their relatives, the moths, are probably the most liked and certainly one of the most easily recognised of all the world’s insects. While the adults may be a welcome sight in our gardens, flitting from flower to flower in search of nectar, their caterpillars seldom are – at least not when they appear in huge numbers and seem hell-bent on causing wholesale defoliation of our treasured flowers and vegetables. Some of the most familiar caterpillar pests infest cabbages and other brassicas, including brussel sprouts, cauliflowers, kale and kohlrabi. The most common of these is the larva of the Small Cabbage White Butterfly (Pieris rapae) – a pale green, velvety-looking caterpillar, which is responsible for much of the damage done to these plants over a period stretching from April to October. Two other insects – Large Cabbage White Butterfly (Pierris brassicae) and the Cabbage Moth (Mamestra brassicae) – also cause problems for a similar range of food plants. Large Cabbage White caterpillars have slightly hairy, yellow bodies covered in dark black markings, while the Cabbage Moth are pale green and very smooth. Named after their characteristic walk – the caterpillar moves by making its body into a loop as it moves along – loopers are one of the most important groups of pests for trees, shrubs and bushes. They are particularly partial to young, lush growth in the spring, moving on to tender petals and flower stalks as the season moves on – and making a real mess of the plants as a result. There are many kinds to be found, all of which grow to around an inch and a quarter (3cm) in length; amongst the most common are the likes of the Magpie Moth, the March Moth, the Mottled Umber Moth and the Winter Moth. A number of leaf-eating caterpillars can make meals out of the plants in our flower beds. The emerald green larva of the Angle-Shades Moth, for instance, can wreak havoc on dahlias and gladioli, while the hairy caterpillar of the Vapourer Moth is a serious potential nuisance for trees and shrubs, as well as occasionally attacking border perennials too. 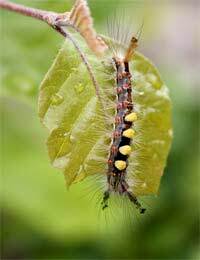 Other moth caterpillars to look out for on leaves and flowers include those of the Rosy Rustic, Buff-Tip and the Garden Tiger moths, while the creamy white larva of the Swift Moth lives in the soil and eats roots, bulbs and tubers. Vigilance is essential if you’re going to avoid too much damage from these pests. From early spring, it’s a good idea to inspect the leaves and stems of susceptible plants for eggs and remove them – or any newly hatched caterpillars – by hand. Although it’s a time consuming job in a big garden, in the long run it’s likely to prove simpler and more effective than having to resort to insecticides if things get out of hand – though if you do need to resort to chemical methods, there are plenty of good products on offer. For long term natural control, in addition to planting insect repelling plants like Tansy and encouraging birds and other caterpillar-eaters to the garden, it can often be a good plan to avoid having too many nectar-rich flowers right next to vulnerable plants. If fewer adult butterflies are attracted to the area, the number of eggs laid should be reduced; you can always find somewhere else for your buddleia – so you needn’t miss out on having butterflies around altogether. Of the 2,500 species of moths and butterflies found in the UK, fortunately only a relative handful make serious pests of themselves in our beds, borders and vegetable plots, but left to their own devices, they can prove remarkably destructive in a very short time. The key to controlling them – like any other pest – lies in taking timely action and knowing your enemy!